In the first series of tea cards, a colorful wall chart was offered for .25¢. After that, Red Rose thought it would be a good idea to do a little promotion in schools. 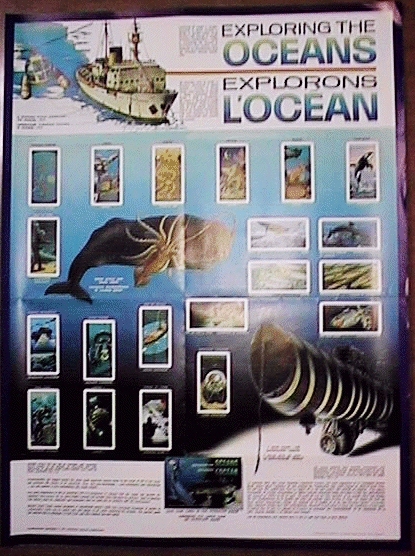 Wall charts were offered to schools for educational purposes. Typically, a school wrote to Red Rose requesting the educational material and they responded by mailing the school a poster along with a set or sets of cards, and album, and sometimes other objects. What is on the Wall Charts? All kinds of interesting facts, lots of pictures of cards, a picture of the album and typically a few other pictures, sometimes blow ups from other cards, sometimes new art work or facts relating to the topic. There is always a blurb about how the posters are to be used. It varies a bit over time. Here are the different wordings I have seen as far as the purpose of the charts. I omitted the addresses. If there are two addresses listed, then it is Canada and the US. One address is just Canada. What Series had Wall Charts? That is a good question. I don't really know the answer. I can tell you which wall charts I have either seen with my own eyes or have seen a scan of. Having said this, if you own something that is not on the list, please email me with a scan and I'll give you credit and post it on this page. I am not aware of any US / Canadian variations. As far as I know, requests from either country resulted in the same wall chart. This seems even more plausible when you read the purpose blurbs above. Shows 18 cards, an album and 1 image. Shows 17 cards, an album and 1 image. Shows 20 cards, an album and 3 images. Shows 13 cards, an album and 3 images. ------------- I have never seen one.